This book is a remarkable project and a "must read" for anyone interested in underachievement. The authors articulate underachievement with reflexivity difficulties, and use narrative construction of meaning (through different mediums) as a path to stimulate reflexivity, and improve academic success; making this book a very relevant publication in this field. As a researcher on narrative and psychotherapy, I particularly appreciated the way narrative as an holistic concept fits this project: narratives are not just in the "heads" of people, but also in their bodies and in the socio-symbolic constructions people share with each other. A very rich, creative and solid contribution! Improving the life chances of non-traditional and underachieving students is one of the most important contributions that higher education can make to social mobility and social justice. Much has been written about the need to ‘raise expectations’ and ‘boost confidence’ so that people from disadvantaged backgrounds can thrive in unfamiliar academic environments. This book focuses on the role of narrative approaches in fostering reflexivity, and thereby promoting learner agency. The approaches themselves are rooted in experience as well as in a thorough understanding of learning theory, and they have been tested in a variety of settings. I’ve always sought to teach in ways that are challenging but inclusive, demanding but empowering, and this book comes as an important resource. This book is a major advancement in the application of narrative techniques in the context of students who are in trouble with themselves in the context of higher education. The focus on (under)achievement is translated here into reflexivity as observed in narrative practices. The development of new techniques is well described in the book, and should be of great interest to practitioners in counselling and higher education administrators. I consider this book a useful proposal for students, researchers and practitioners. The current situation is exacerbating the vulnerability and undermining solidarity, so attention to inclusion and to at risk individuals are crucial. I emphasize the value of the topic, the focus on reflexivity and its analysis from different points of view, as well as the focus on strengthening the reflexivity in particular in at risk individuals. At this regards the book provides basic topics and specific insights, involving scholars from different nations and proposing in-depth qualitative analysis. 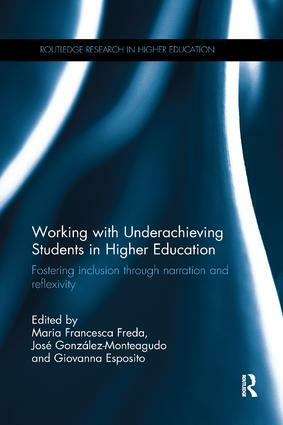 This is an important book from an interdisciplinary, multi-national team, wrestling with issues of under-achievement in higher education, and how this might be addressed in theory and practice. The study begins from the premise of the importance of social inclusion in Europe, and a wider world, in which exclusion, social and educational inequalities are tending to worsen; and where the forces of xenophobia, racism and fundamentalism are getting stronger. The book pushes us towards new thinking, in the use of narrative and reflexivity, to enable unconfident learners to consider their academic and personal struggles in a developmental frame – the Narrative Mediation Path. This combines psychological, therapeutic, educational and artistic expertise and insights. It utilises forms of imaginative writing that draw on metaphor, iconographic techniques, and embodied experience in creative ways. This book is a real resource of hope in a hard-pressed university world. What is also welcome is the strong representation in the research team from southern and Eastern Europe, which helps counter the tendency of the Anglophone world to dominate the international literature on universities and their students. Maria Francesca Freda is Professor of Clinical Psychology in the Department of Humanities, University of Naples Federico II, Italy. José González-Monteagudo is Professor of Educational Theory at the University of Seville, Spain. Giovanna Esposito is Post Doc Researcher in the Centre for Active and Integrated Inclusion of Students (SInAPSi), University of Naples Federico II, Italy.